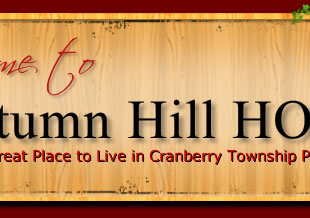 Welcome to Autumn Hill, a housing plan in Cranberry Township, PA. Autumn Hill consists of 177 home sites, 2 playgrounds, numerous walking trails and a tremendous amount of green space. 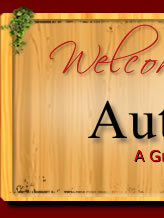 This site is where you will be able to find the answers to most of your questions about Autumn Hill. If you need further assistance, please don't hesitate to email us at: bod@autumnhillhoa.net or contact Cranberry Community Management at 724-799-5152. There have coyotes spotted in the area. Please read the flyer below for additional information on living with wildlife. The management company and the HOA are aware of the deer stand in close proximity to Autumn Hill property. We have contacted the proper authorities. However, the deer stand is not on HOA property. The Board does not monitor postings on Nextdoor. Please contact the HOA via the management company at 724-799-5152 or the "Contact Us" section of the Autumn Hill website with any concerns. The Board would like to clarify its stance on Nextdoor. Nextdoor describes itself as "Nextdoor is the private social network for you, your neighbors, and your community." The Board has no control of anything that is posted on Nextdoor and the official policy of the Board is NOT to respond to questions, comments or complaints posted there. If any neighbor has a question, request, or complaint they want the Board to address, please send them to Cranberry Community Management at angela@cranberrypm.com or telephone 724-799-5152; or the Board's email account at bod@autumnhillhoa.net. The Board will use Nextdoor to post general information, such as upcoming social events. Individual members of the Board may post their own personal comments, and they are not to be construed as the opinion of the Board. Please login to view this area.